If Hobos Had Couches . . . This could have been Henry! 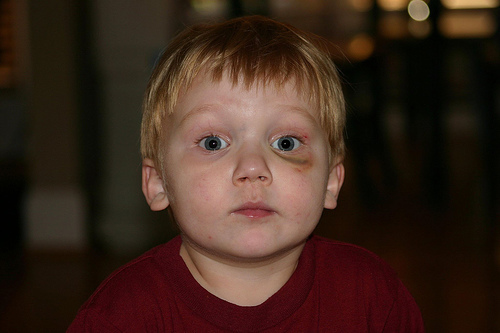 Except that this is a child I've never met with a black eye. I found him in a creative commons photo on Flickr. We are growing up. As evidenced by: the futon frame is finally gone. In college, futons signaled freedom. I had my own room. I wanted my own bed. I wanted it not to be a single bed! Enter the first futon. Since I turned 18, I’ve had more futons than I can keep track of. And at some point, I wanted to distance myself from transitory-seeming furniture. Finally, when I lived alone in a Brooklyn studio at the apex of my high-style bacheloretteness, I had one real bed and two real couches. No futons: purge complete! So what if the white couch came from the Salvation Army? The green couch had royal lineage: ie Conan O’Brian had napped upon it. Which cancels out both the Salvation Army detail of the white couch, as well as the fact that Sir Arthur Conan Doyle had probably napped on it. I, meanwhile, was napping in a real bed, like the grown-up lady that I am. I’ve been plotting to get rid of Matthew’s futon since I met him. But there is a natural law that states: the more one person doesn’t want the [futon], the greater the other person’s drive to keep [it] at any cost. He was so attached to the disintegrating frame that he’d do anything to prevent it devolving into a cloth and wood puddle on the floor — which was apparently its dying wish. He’d procured and then screwed in some crazy metal braces to hold the thing somewhat together. To complement the braces, he arranged the world’s largest rubber band around the mattress so it wouldn’t flumpf to the floor. But Friday night, he methodically dissembled and then got rid of it. That’s because Thursday night, Henry had dived, eye-first, into one of its sharp edges. I wasn’t overly concerned, since that accident paled in comparison to the diving-onto-the-tiled-bathroom-floor accident that Henry had accomplished earlier in the day. But Matthew didn’t have the bathroom floor stunt for contrast, and this one did look sort of horrifying, taken on its own. The fate of the futon was finally sealed. Regardless of the prior emotional attachments, things are changing, and Matthew certainly isn’t going to stand by and defend a failing and cheap couch while it passively attacks his firstborn son. If I had known that all it took to get rid of the futon was to throw your eye against it as hard as possible, I’d have a lot of audiobooks on the shelf. Thanks to wjarrettc on Flickr for use of the photo. ← Which Favorite Flavor Is Yours? Not sure I understand this, but still funny!